Published 2013-07-10 at 450 × 291 in KG_Mathew_Staver_Liberty_Co.4. 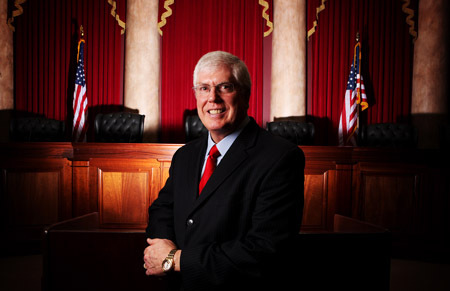 4/16/2012 Mathew Staver, Dean of Liberty University School of Law and Chairman of Liberty Council, poses inside of a Supreme Court inspired courtroom on the Liberty campus. Mathew Staver heads Liberty Counsel, the group that is defending Giles County against a lawsuit over displaying the Ten Commandments in one of its schools.